This is a review of the $5-8 online TESOL course on Groupon by International Open Academy (IOA). You will find a collection of reviews here that I found on the web here about their online TESOL course. It also includes some information that I gathered from research on their site below. Why would you sell something valued at $499 for $8? But it's not just them. Most of the courses on Groupon use headlines like this. Big "savings" are used to sell courses. Here is a review from Shaquan Jones on Youtube. "I found it paid for it... It was $499 for it first, but they have a Groupon running where you can take the class for $5 which worries me. Over the fact that it's $499, but you get the Groupon and it's just $5 and you have 150 days to complete it. It's a 150 days to complete it, unless you purchase extensions. The other thing is that the classes are extremely short. I completed it in 2 days. These are some reviews about the course that I found on Reddit. "I bought this when it popped up last time and my reaction was similar to yours "well.. it's only $5." Outside of two-ish modules on the linguistics of English, it is not interesting or worth your time as a majority of the modules are really general and basic summaries. Each of the 10 modules has five chapters and each chapter is two to three paragraphs, that's it. There are a lot of grammatical errors. If you are wanting it to actually learn, skip it. You'll learn more from the resources available on here and other TEFL boards for $0. Learn more about what Reddit thinks about online TEFL courses. This is a text-based course and there is no video. 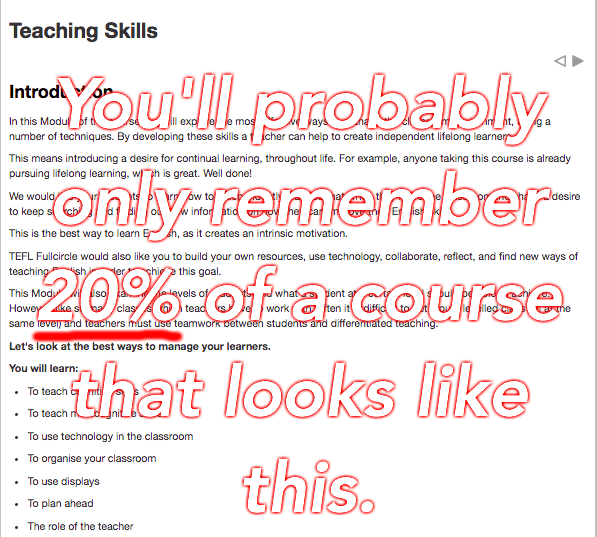 Most people only read 20% of the text on a page which means that you probably won't remember much or learn much from this course. On the other hand people tend to remember video. Learn more about why video trumps text as a teaching tool. Did they lie to you? TEFL courses don't actually have to be accredited and there is no one governing body for TEFL accreditation. But besides that fact IOA claims to be accredited by ICOES (International Council for Online Educational Standards). So I went to that site to check it out. One of the first things I noticed was that the 2 sites (IOA and ICOES) look kinda similar. Nevertheless I decided to go and check out who else they accredit. I figured if they accredit IOA then they probably accredit other courses. The strange thing that I found was that they had a search field on that page. Why would an accreditor do that? Accreditors want to make money too. Did you think accreditation was free? Accreditation is B2B business in the TEFL course world. So I would think that they would want to show off the other schools that they accredit as testimonials. Back on the IOA site they do list a code that you can input into that field. However, they don't appear to accredit anyone else. I did a Google search for ICOES.org and couldn't find any other sites or courses that were accredited by them. ICOES and international open academy look like the same people. If I was going to bet money on it I would say that they are owned by the same person. But ahhh, what did you expect for $5 on Groupon? On one hand I understand why you may be concerned for whatever reason about this TEFL course, but did you really need a review? It costs $5 or $8. Are you afraid of wasting your money? What money?